윤명숙, 김남희,(2013).대학생의 상실경험과 대학생활 적응 관계에 대한 성인애착의 매개효과.정신보건과 사회사업,41(1),60-89. 본 연구는 대학생의 다양한 상실경험이 대학생활 적응에 미치는 영향을 성인애착이 매 개하는지 검증하기 위한 연구이다. 이를 위해 3개 권역 4년제 대학에 재학 중인 891명 의 대학생들을 대상으로 구조방정식을 사용하여 분석하였다. 연구결과 첫째, 인구사회 학적 차이에 의한 대학생활적응을 살펴본 결과, 남학생들이 여학생들보다 더 높은 것으 로 나타났고 성적이 높은 집단이 대학생활 적응이 높았으나 다른 변인들은 유의미하지 않았다. 둘째, 대학생의 사별, 가족상실, 관계상실, 건강상실 등 상실경험은 대학생활 적응에 유의미한 영향을 미치는 것으로 나타났다. 셋째, 성인애착은 대학생 상실경험이 대학생활 적응에 미치는 영향을 부분 매개하는 것으로 나타났다. 즉, 상실경험은 대학생 활 적응에 직접적으로 영향을 미치기도 하고 성인애착수준이 높을수록 대학생활 적응이 증가하는 간접적인 역할을 하는 것으로 나타났다. 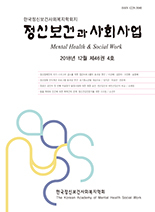 이러한 결과를 바탕으로 대학생들의 정신건강을 증진시키기 위한 실천적 제언을 제시하였다. This study examined the mediating effect of adult attachment on the relationship between loss experiences and student adaptation to University. The subjects of this study were 891 university students over 3 provision and subjects completed a test of loss experience, Recised Adult Attachment Scale(RAAS), Student Adaptation to College Questionnaire(SACQ). Structural Equation Modeling in AMOS 18.0 and SPSS 19.0 were adopted to examine measurement model and mediating effects of adult attachment by using bootstraping method. The results were as followings; First, male student and high academic garde group showed more higher student adaptation but there were no significant difference by other sociodemograpic factors. Second, loss experiences were significantly affected to the adult attachment. Also adult attachment were significantly affected to the student adaptation. Third, adult attachment partially mediated the association between loss experiences and student adaptation. Based upon these findings, we suggested to improve mental health care of University students and the implications and limitations of these findings were discussed and directions for future studies were also proposed.